Bidh Once In A Lifetime le Runrig 30 bliadhna a dh’aois an ath mhios. Tha Eòghan a’ coimhead air clàr beò cho math a bha riamh ann. Bidh Runrig anns a’ Ghearmailt an deireadh-seachdain seo, a’ cluich nan consairtean mu dheireadh anns an dùthaich sinn a thug an uimhir de spèis dhaibh thar nam bliadhnaichean fada. Ann am beagan nas lugha na trì miosan, cha bhi iad ann tuilleadh, agus bidh gu leor sgrìobhte ’s ga ràdh man deidhinn aig an àm sin. Bho bhun gu bàrr, tha an clàr iongantach. Tha e a’ tòiseachadh le fuaim mòr giotar Mhalcolm Jones air Dance Called America agus na lùib Donaidh a’ seinn thairis air a’ chiad chord-chumhachd sin, buillean drumaichean Iain Bayne agus an uairsin tha an còmhlan air fad a’ tighinn a-steach airson trì cairteal na h-uarach de cheòl cho neartmhor a thàinig às an Eilean Sgitheanach. ’S e comharra air sàr-chlàr beò nuair a bhios òran ga thoirt dhan ath ìre on fhear a bha air a’ chlàr bho thùs. Tha a h-uile òran a’ faighinn togail air Once In A Lifetime. Is ann air a’ chlàr seo a tha an tionndadh de Loch Lomond a thèid a chluich aig a h-uile banais Albannach thall ’s a-bhos. Cuideachd ha na h-òrain o Play Gaelic (Chì Mi’n Geamhradh), Highland Connection (Going Home) agus Heartland (Cnoc na Fèille agus Dance Called America) uile a’ faighinn spionnadh as ùr o bhith gan ath-chlàradh, agus le meur-chlàran Pete Wishart agus ruitheaman ioma-fhillte o Bhayne, anns a h-uile dòigh tha iad air thoiseach air an fheadhainn a bha air na clàran sin. Tha Dance gu sònraichte a’ gabhail ceum air adhart, ’s na briathran anabarrachd drùidteach ud buileach nas cumhdachaiche ri linn sin. Tha Protect and Survive agus Rocket to the Moon a bha air nochdadh air The Cutter and the Clan a’ bhliadhna roimhe a’ seasamh a-mach mu thràth, agus ’s gann gum biodh consairt RunRig ann as dèidh sin far nach deach a dhà dhiabh a chluich. Is seo an còmhlan-ciùil mar as fheàrr le mòran on Ghàidhealtachd a chuimhneachadh, is iad eadar a’ chiad shoirbheachas leis The Cutter & The Clan agus na làithean buidhe coimearsalta leis a’ chompanaidh Chyrsalis a bhiodh ri teachd. Ach ’s mathaid gur e an càraid de Nightfall On Marsco/’S tu mo leannan agus Skye a bhios a’ sealltainn fìor chomas Runrig aig an àm sin. Tha an ceòl a’ freagairt ris na h-ìomhaighean Leathanach a bhios Calum a’ snìomh air feadh Marsco, agus an uairsin tha an gluasad eadar Marsco, Leannan agus a-steach gu Skye cho ealanta nach fhàsadh tu sgìth de dh’èisteachd ris. Tha fios aig a h-uile fìor neach-leantainn gur ann nuair a thèid Skye a chluich gum bi am pàrtaidh a’ tòiseachadh aig consairt Runrig (agus gu math tric nuair a bhios muinntir na Gearmailte a’ fàs caran mì-fhoighdineach leis an luchd-leantainn beòthail òg!) agus ’s ann air Once In A Lifetime a gheibh sinn an sàr-chlàradh de dh’òrain a tha a-measg na h-òrain a b’ fheàrr a chaidh a sgrìobhadh air kazoo riamh. Is nuair a sheinneas Donaidh Hearts of Olden Glory airson soraidh slàn a thoirt dhuinn mar gum biodh, cluinnidh sinn an guth treun beò sin a tha an còmhlan ag ionndrainn fhathast ach cuideachd a bhios a’ sealltainn cho sònraichte a dh’fheumadh Brus Guthro a bhith airson na brògan mòra sin a lìonadh cho math. 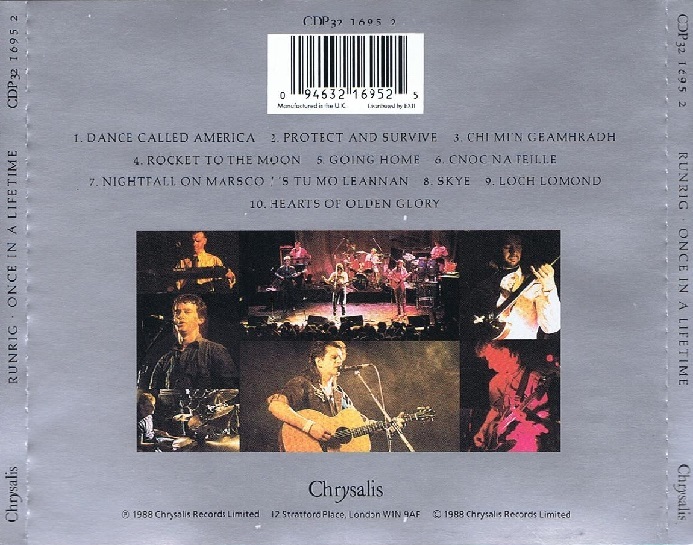 Chan eil fios agam cò th’ ann an Kit Kiefer, ach bha e na sgrìobhadair lèirmheas airson an làraich-lìn-ciùil allmusic.com a bhios a’ toirt lèirmheas air clàran airson companaidhean leithid Spotify, Tidal is Windows Music is eile. Cha robh e gar mealladh nuair a thuirt gun robh Once In A Lifetime, a-measg nan deich clàran beò a b’ fheàrr riamh. Nam bheachd, tha e cho làidir ri Bob Marley Live!, Talking Heads Stop Making Sense, The Who Live At Leeds, fiù ’s (agus bidh Alasdair Falt Fada as mo dhèidh ’s dòcha!) Thin Lizzy Live & Dangerous. Is e seo an t-sàr obair, ’s e seo a’ chlach as motha air an càrn. Agus dè nì sinn nuair a bhios Sruighlea seachad? Siuthad. Bi beò sa mhomaid. Èist ri Once In A Lifetime. Cluich e dha do chuid-chloinne. Cuimhnich iad mar seo. Tha a’ bhiothbhuantachd aca. Chan fhaic sinn an leithid a-rithist. 5 An t-Ògmhios 2018 in Ceòl.